These are 10mm Gold Filigree Bead Caps - approx. 50 caps in a bag. These are 10mm Round Silver Filigree Metal Beads with approx. 35 beads in a bag. These are 10mm Silver Filigree Bead Caps - approx. 50 caps. These are 10mm Silver Filigree Bead Caps with approx. 50 caps in a bag. These are 12mm Gold Filigree Bead Caps - approx. 50 caps. These are 12mm Round Gold Filigree Metal Beads, approx. 25 beads in a bag. These are 12mm Round Silver Filigree Metal Beads with approx. 25 beads in a bag. These are 12mm Silver Filigree Bead Caps, approx. 50 caps in a bag. These are 14mm Round Gold Filigree Metal Beads with approx. 20 beads in a bag. These are 16mm Round Gold Filigree Metal Beads with approx. 15 beads in a bag. These are 16mm Round Silver Filigree Metal Beads with approx. 15 beads in a bag. 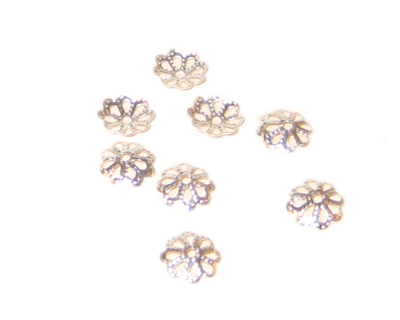 These are 4mm Round Silver Filigree Metal Beads with approx. 65 beads in a bag. These are 6mm Round Silver Filigree Metal Beads with approx. 45 beads in a bag. These are 6mm Silver Filigree Bead Caps - approx. 50 caps. These are 8mm Gold Filigree Bead Caps - approx. 50 caps. These are 8mm Round Silver Filigree Metal Beads with approx. 40 beads in a bag. These are 8mm Silver Filigree Bead Caps - approx. 50 caps.